I'm thankful for each and everyone one of you. Have a happy and safe holiday. My updates are probably going to be rather sporadic for the next few weeks. If you have any questions or subjects you would like me to blog on, feel free to post them in the comments. I recently returned from the Dahlonega Literary Festival, a great book festival in an artsy little town in the Georgia blueridge area. I had an absolutely wonderful time and met many amazing people during the weekend event. I also stayed at the cutest little bed and breakfast called the Lily Creek Lodge, and if anyone ever wants to escape for a weekend, I highly recommend it. I have to seriously wonder where the saying "grab some grub" to mean get some food came from. Why am I wondering about this? Mostly because I just spent the last two hours in my garden fighting a grub infestation. I mean really, do these guys look yummy to you? Yeah, me neither. And I must tell you, I'm rather distressed by their presence. When I first moved to my new place, I put three 4X4 garden plots down, but I only used two of them because it was so late in the season. The third I decided I would be enterprising, and as this development was built on nutrient deficient sand, do a little open air composting. I have a compost bin, but as a whole I have more grass clippings and weeds than I need in a single bin, so I dumped the extra in the empty garden bed hoping it would improve the soil by the time I'm ready to plant next spring. At first I turned and watered it regularly, but then I probably got a little slack. 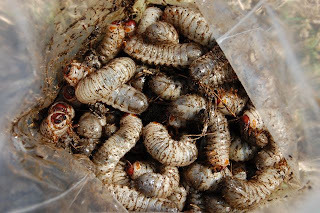 Recently I noticed the grubs. Major ick. 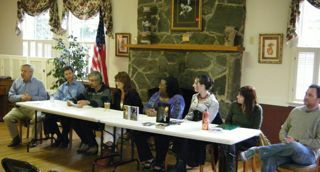 I know I posted a while back that my conference and convention season for 2010 was over, but a couple weeks ago I was invited to be a guest at Dahlonega's 7th annual Literary Festival and I was delighted to accept. The festival is this weekend (November 12-14th) in Dahlonega, GA and based on the schedule I just received, it will be a wonderful event. Saturday 10:45 - 11:30 - Fantasy vs. the Great American Novel. So much has been going on recently that I haven't had a dedicated NaNo post since the begining of the challenge (and I'm actually putting off releasing news today--it will wait a day). Today let's talk words. Week two of the challenge has now started. Everyone still pushing along? How is the wordcount coming? According to my chart, today's word goal is 15k words. (Okay, technically 15,003. Let's be exact.) Have your characters surprised you with what they've said or done? Any unexpected plot developments? 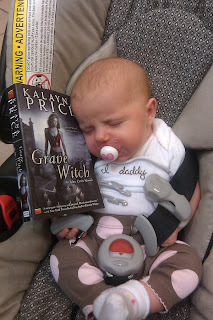 The polls have closed and the Grave Witch in the Wild contest is now officially complete. The votes have been tallied and with 27 votes in the sidebar and 17 votes in the comments the winner is: Kitty with the Kindle! Congratulations Dawn! Please email me at Contests(AT)kalayna(dot)com with the shipping address of where you'd like the bookmark to go and let me know if you want the ghost or tombstone. (click here for pictures). November 4th 2010 might forever be known as the day the internet fought copyright infringement. Most of you are likely already familiar with the events surrounding Monica Gaudio and Cooks Source Magazine, but for those new to the story (were you away from your computer yesterday?) I'll recap very quickly. 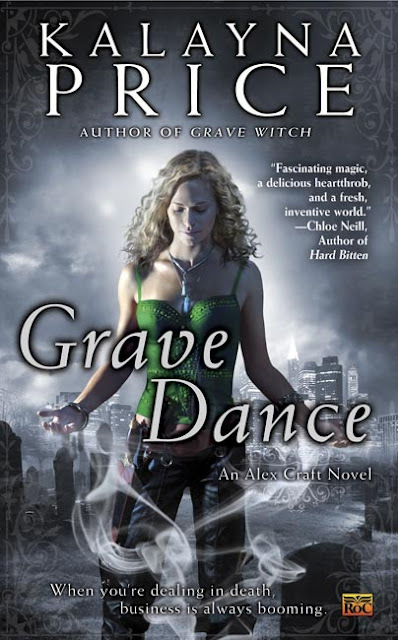 Today is the day, and I am very pleased to reveal the cover for the second Alex Craft novel, GRAVE DANCE. I could build this up a bit, but I think I'll just splash the cover and not keep you waiting in further suspense. Personally, I think it's absolutely striking. It retains the ethereal and contemplative aspect of the Grave Witch cover while the closer crop and forward angle of Alex's body adds an edge of power and assertiveness. The cityscape visible behind the cemetery is a gorgeous touch, and I love that they kept the subdued blue greys overall with just a single splash of brilliant of color with Alex's shirt (green this time). In short, I love it and I absolutely cannot wait to see it on the shelf beside the first book! It's day two of NaNo. How are things going? I saw several of you knocked a nice chuck of your word count out last night. Congrats! If you find you're falling a little behind, no worries--you have plenty of time to catch up. If you find you're spending a lot of time staring at your screen and not writing, try setting a timer for short bursts of writing--try 10 to 15 minutes at a time and you might be surprised what you can accomplish when a timer is counting down. If you're having trouble carving time to write out of your busy day, remember that you don't need long periods of time. If you can jot down a sentence or two at a time while cooking dinner or waiting on the kids to get out of after school activities you'll find yourself a lot closer to your goal when you finally do reach your computer. (Also, thinking about your story throughout the day will keep it percolating in the back of your head.) So, how are those word counts looking? Nano Day 1: What the heck is NaNoWriMo anyway? 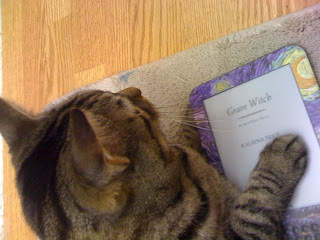 Before I start talking about NaNo, let me first remind everyone that today is the very last day to enter the Grave Witch in the Wild contest. I'll be posting the finalists tomorrow, so make sure you get your entries in by midnight tonight! Okay, now on to today's blog post. It's November first, which means it is the first day of NaNoWriMo. All over the world thousands of people will be putting words to the page and starting novels today. Are you one of them?